Visiting Kerala? Here are some festive travel tips for you! 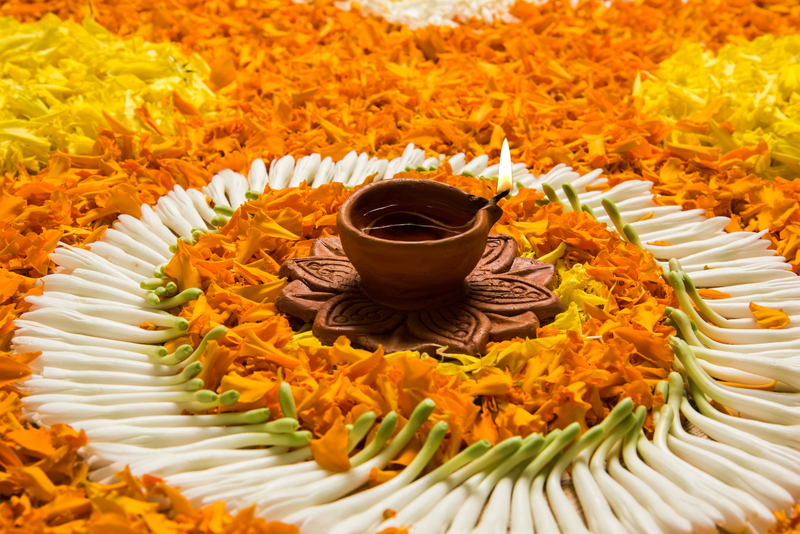 Onam festival celebrates the many elements of Kerala’s traditions and culture. 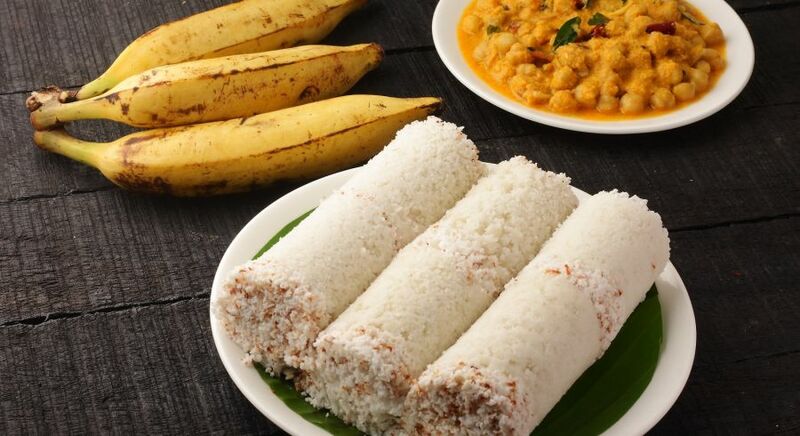 Signalling the end of the monsoons, this annual ‘harvest festival’ unites the people of Kerala with a ten-day celebration during ‘Chingam’ (the first month of the Malayalam calendar / August-September as per Gregorian calendar). Onam festivals starts on 24 August 2018. Onam is also mythologically linked to Malayalee-Hindu folk tales, one which marks the homecoming of legendary ‘asura’ or ‘demon’ King Mahabali from the underworld, while another claims Onam was the day Parashurama – an avatar of Lord Vishnu – founded Kerala state from a sea bed. 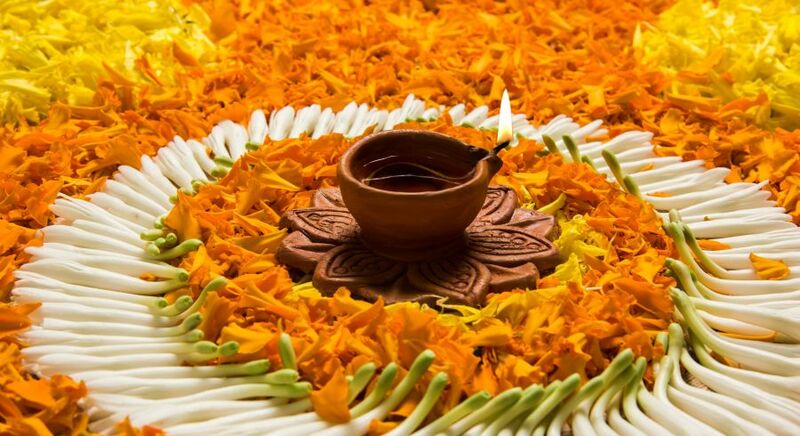 A vibrant and colorful festival, Onam is likewise considered the ‘festival of flowers’, and wonderful flower decorations are created inside and outside homes. Enjoyed by all religions, this ancient festival displaces all barriers of caste and religion, propagating that all people should live harmoniously in unison. Kochi, Trivandrum, Thrissur, and Kottayam are where the most spectacular celebrations take place. Thrikkakara Temple, 15 kms northeast of Ernakulam, is especially associated with Onam Festival. Every Onam, Malayalees revive and relive the happy times under Mahabali’s reign. Locals wear new clothes; homes are colorfully decorated; elaborate ‘pookalams’ (floral carpets) are created in front of homes; and a grand celebratory ‘Onamsadya’ feast is prepared. Apart from the joyous festivities of family and feasting, various energetic and fun-filled activities enthrall Malayalees during Onam. Here’s eight of the most riveting and inviting festival attractions…come, join the fun! 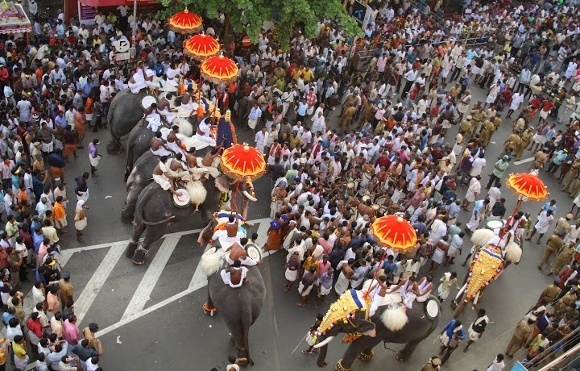 Marking the start of Onam, Athachamayam is a colorful inauguration featuring a street parade of different Kerala art forms, musicians, dancers, carnival floats, decorated elephants, etc. Date and Venue: 15 August, 2018 – Thripunithura, in Ernakulam’s greater Kochi. 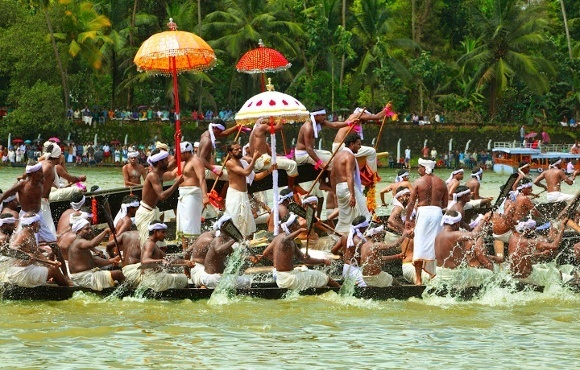 Unlike other competitive snake boat races, Aranmula Snake Boat Race is more a traditional ritual with religious elements. 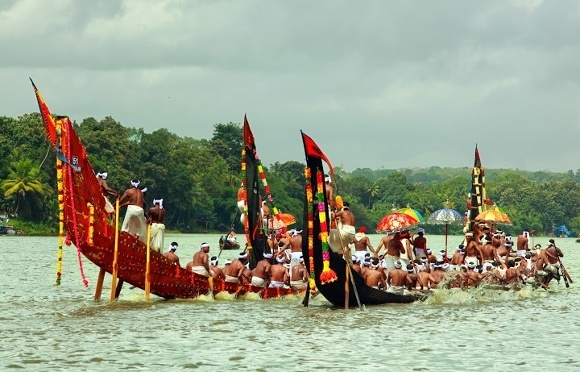 Kerala’s oldest and most popular boat race attracts scores of spectators, both local and international. About 50-plus boats participate in the race commencing in the afternoon after all religious rituals are over. On Thiruvonam (the festival’s tenth day), Aranmula Temple rituals are overseen by the patriarch of a renowned Brahmin family. Onathallu is an extremely competitive freestyle martial arts form. This bare-handed mock fight has combatants facing each other without any weapons or rigid rules, except that it is prohibited to hit the head or face, and punch or kick. Flower decorations for Onam in Kerala. Men of all ages dressed in dhotis, plain white cloth wrapped like shorts, test their stamina, skill and physical abilities. Onathallu ideates the martial spirit of warriors. 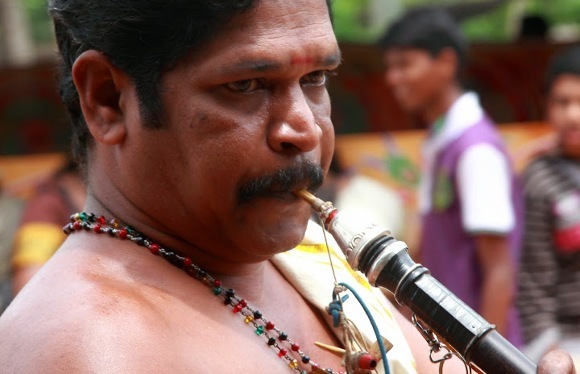 Meaning ‘the play of the tiger’, Pulikali dates back over 200 years. It was introduced by the former Maharaja of Kochi who wanted a dance that was wild and had oodles of manliness! 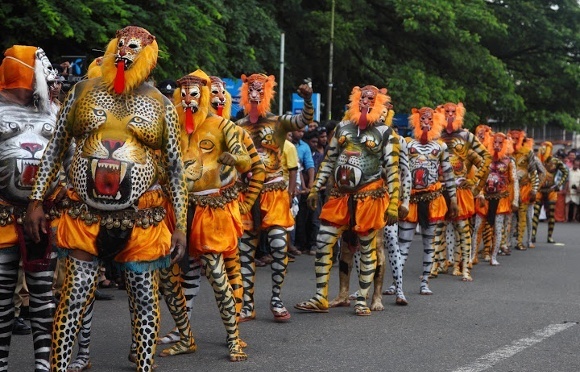 Hundreds of performers colorfully painted and dressed like tigers dance to sounds of traditional music. Moving in street processions, they pounce and shake their bodies to the rhythm of drum beats. Following close behind are rifle armed hunters. Kaikottikali or Thiruvathirakali is a popular folk group-dance performed by Kerala maidens in traditional attire. Eight to ten women perform in rhythmic and symmetrical movements. One performer sings the first line of the song while others repeat in chorus clapping hands. 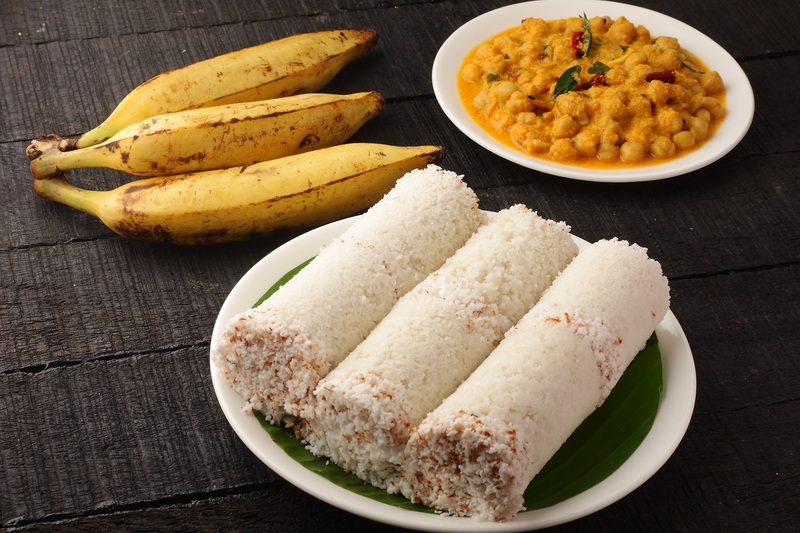 Puttu – A popular dish in Kerala. This captivating all-women song and dance art form is derived from the word ‘thullal’ meaning ‘caper’ or ‘to leap about playfully’, and originated in the eighteenth century. Combining both recital and dance performances, thumbi thullal elucidates tales narrated in verse. The lead performer initiates the song, followed by another who repeats in chorus, accompanied by an orchestra of mridangam (percussion instrument), harmonium and cymbals. Women in beautiful sarees, amazing jewelry and fragrant gajras (flower garlands), perform in a circular formation around the main singer. The collective name for the tradition of playing indoor/outdoor games during Onam, Onakalikal is usually enjoyed after Onasadya. Men participate in Talappanthukali (playing with a ball), Ambeyyal (archery), Kutukutu or Kabaddi, and Kayyankali and Attakalam combat games. Women indulge in cultural activities. 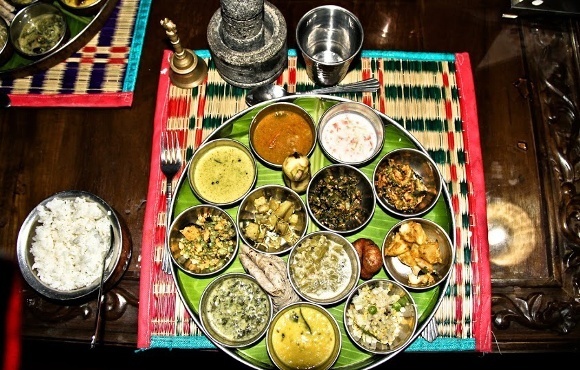 The highlight of the festival, Onasadya or ‘Onam Feast’, is a hearty nine-course meal comprising 11-13 all-important traditional dishes served on banana leaves and eaten seated on mats laid on the floor. 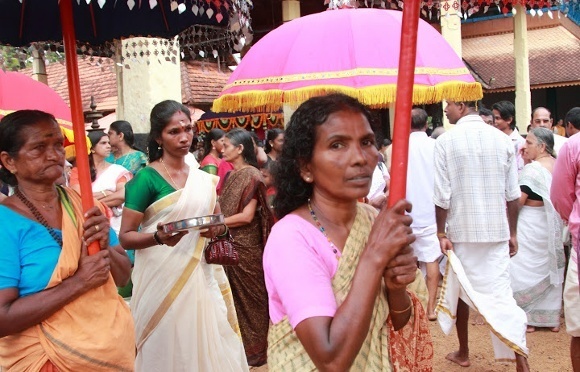 Held on the last two days of Onam at Thrikkakara Temple, about 10,000 people attend Onasadya festivities. Considered a form of worship, Onasadya begins at 10 am and ends by 5 pm. Best Place: Thrikkakara Temple. Throughout Kerala.